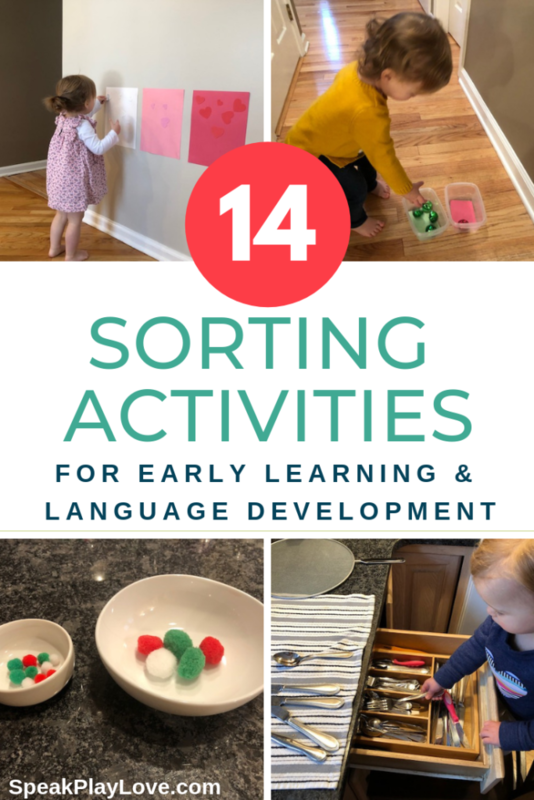 14 Sorting Activities to Encourage Language Development | Speak. Play. Love. 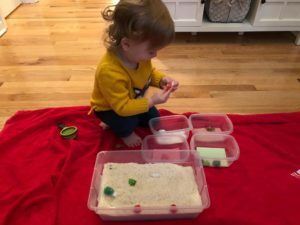 Sorting activities can range from super simple to more complex – making it great for toddlers (starting around 15-18 months) all the way up to early elementary. It also keeps little hands and bodies busy, which is always a plus! One reason that sorting is so great for language development is because it mimics the way that our brains naturally learn and “file” new vocabulary in our brains. When we hear a new word for the first time (as a child or an adult), we use a technique called fast mapping to decide where to store that information in our brains. Then as we hear that term again and again, our brains refine where to file that word (slow mapping). This process is essentially a massive sorting and categorizing task that our brain does in a matter of seconds. It’s pretty amazing! 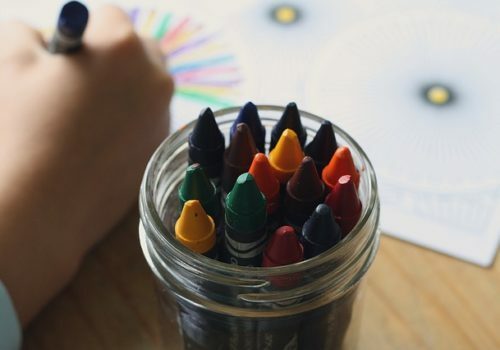 One of the first sorting activities that you could try with your toddler is a color sorting activity that also has a matching element to it to make it a little easier. We used plastic containers with a piece of construction paper taped into the bottom to sort red and green jingle bells as a Christmas activity. I put the bells all throughout our hallway/foyer area so Sylvie got some energy out on a cold day. I was surprised how much she loved this activity!! I think it mostly had to with the jumbo jingle bells – she thought shaking and kicking them down the hallway was super fun. Putting colored items in a sensory bin is also a great way to target color sorting. In our Christmas Sensory Bin, I put pom-poms and Christmas erasers that were green, red, white and brown in a bin of rice. Related Posts: Read more about our Christmas Sensory Bin or Halloween Sensory Bin. 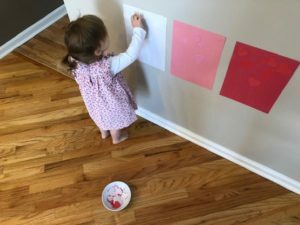 This post from Busy Toddler features a great activity for color sorting using dot stickers and construction paper. This was one of the first matching/sorting activities I tried with Sylvie because she is obsessed with stickers, and dot stickers are so cheap and easy to manipulate! 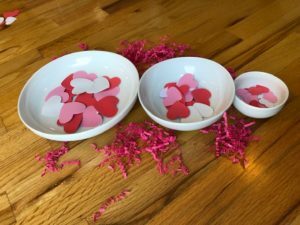 | Update: We tried a Valentine’s Day version of the sticker sort using heart-shaped foam stickers and it was super fun! 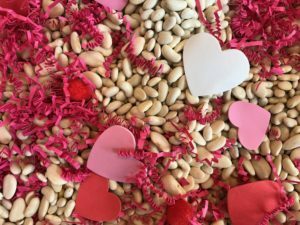 Check out more Valentine’s Day Activities for toddlers here. Location words: in drawer, on top, take out, on shelf, in box/basket, etc. 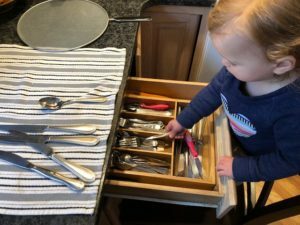 We label the different types of silverware, talk about opening and closing the drawer, and bringing over the chair. If you don’t feel comfortable with your tot standing on a chair, learning towers are awesome! My friend has one and she includes her children in cooking activities and general kitchen helping everyday. Ugh, how many times a day do we have to put away the Duplos?! I still end up doing most of the tidying, but again, making it into a game of sorts can help a bit. Try setting out two familiar containers that your little one can put toys into. For instance, all Sylvie’s Duplos go in the green box they came in and all her balls go into a round container. She knows this because that is where they always are (this might not work as well if your child has one giant toy box). The trick with sorting by texture (soft/hard, rough/smooth) is finding the items to sort. Sometimes I will do a lot of the same items like soft pom-poms vs. hard blocks. But it can also be really fun (and more challenging for the child) to walk around your house gathering items that you can put into your sorting activity. Here is an example of teaching soft vs. hard items from Gift of Curiosity . This sorting rough vs. smooth activity with rocks also uses a “mystery bag,” which adds even more fun! You can check it out at Learn with Play at Home. I thought this was such a clever idea! Unfortunately, Sylvie is afraid of contact paper?!?!? So strange. Hope your little ones like it. You can check out the post at I Can Teach My Child. We combined a Sensory Bin activity with sorting for this sort-by-size activity. This sorting activity with counting bears will take you no time to set-up, which is always a plus! 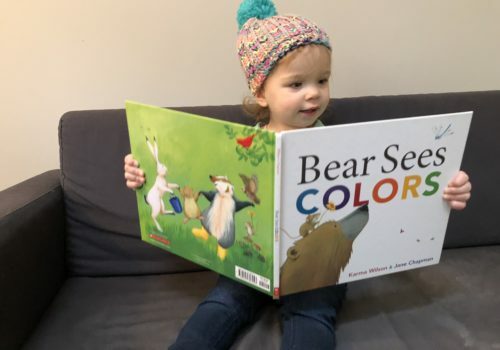 I love that she used different size jars for the bear sorting – so simple but so genius! (You could also use different sized bowls if that is easier!) You can check this one out at PreKinders. Such a cute sorting idea around the holidays! This idea was featured at Learning 4 Kids. When I worked as a Speech-Language Pathologist in a preschool program, I made something like this out of large construction paper that I laminated and then had the students tape on pictures of animals or vehicles based on here they lived/operated. I love this felt version by Slinky + Moose. This sorting activity from The Imagination Tree would be great for preschoolers or early elementary children. It may help for you to exaggerate the beginning sound to help them figure out which basket each object belongs in. I hope that you enjoyed these ideas! I love to hear from readers – please leave a comment below. Does anyone else have a child who hates contact paper?